Join us for a late fall Sunday afternoon of fun, fresh air and baseball! You will help a client and enjoy the game with them. We will reimburse you for travel and some food/drink expenses. Meet Ken, one of our active volunteers at Vision Loss Resources. Ken started with us in early 2017 and he helps us at many of our activities and events, including Craft, Pottery and various outings in the community. Thank you Ken for all that you do to support VLR and our clients! 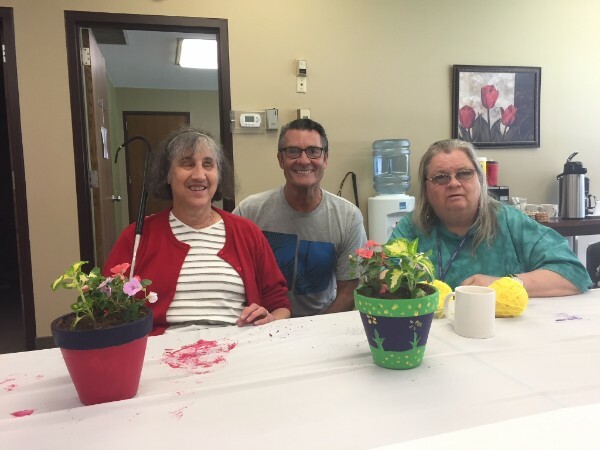 Ken (center) helping VLR clients during Craft Class. I have two daughters, two grandsons (twin four year olds) and two tripod rescue dogs; and just one wife. I love swimming, boating and drone photography. It is not only fulfilling to me, but a way to honor my father who was involved with helping the visually impaired in California. It has made me realize that anything is possible if you have the right attitude. That those without vision can make a more anatomically correct pottery shark than I can! Give whatever time you can. Every minute is appreciated. Anything else you want to share about volunteering at VLR? It’s been a pleasure getting to know and visiting with everyone!